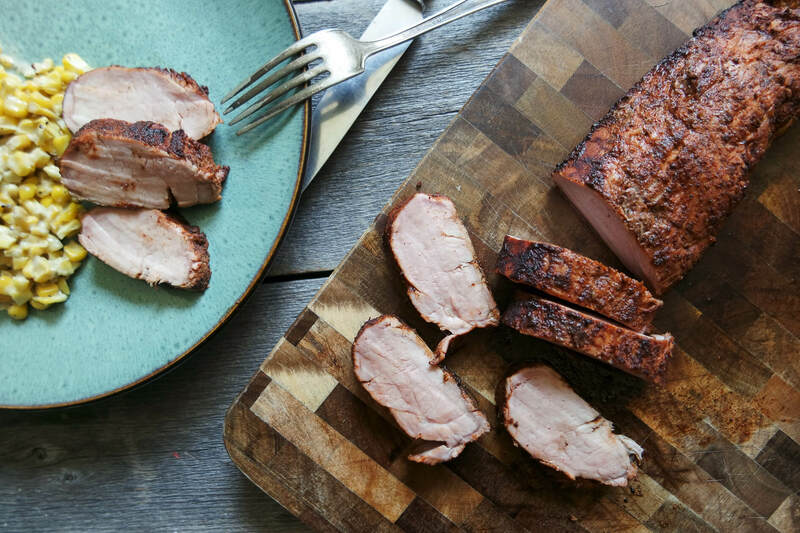 Apple cider pork tenderloin is a great quick cook on the smoker – brining first keeps the meat moist during it’s smoke bath. While most traditional meats for the smoker take at least 6 hours, certain cuts like tri tip and pork tenderloin can be ready to eat in a mere 2-3 hours. Unlike beef which can be smoked to medium rare, pork does need to be cooked to a minimum safe temperature of 145f (fun fact – it used to be 165f until recently revised by USDA). To make sure you are cooking no longer than you need to, I recommend using an instant read thermometer like this Thermapen. If you’re looking for a slightly cheaper option, the Thermapop is a good starting place. A decent meat thermometer is the most important tool in a meat cooker’s tool kit. Even with the new lower safe pork temperatures, pork can tend to dry out. A great solution to this is brining – extended immersion in a wet saline solution before cooking. The brine “forces” liquid into the muscle, increasing the moisture levels before the cook. So you’re basically giving yourself a head start. In this case, the brine is apple cider based – a flavor that pairs so very well with pork. Fruit woods pair best with pork - apple, cherry or peach are all great choices for smoking pork. In a saucepan, combine cider, water, sugar, salt, cardamom and peppercorns. Heat gently until salt and sugar are dissolved. Allow to cool. Trim the tenderloin from any large pieces of fat or membrane and place in a large ziptop bag. Pour in the cooled brine, seal the bag then place in the fridge to marinade for 1-2 hours. Remove the tenderloin from the brine, discarding the liquid. Pat dry with paper towels and season on all sides with the pork rub. Place the tenderloin into the smoker and cook until the pork reaches an internal temperature of 145f. This will take about 1-1.5 hours. When at temperature, remove from smoker, wrap with foil and rest 20 minutes before slicing and serving.